This uses a visual programming language called Blockly which allows students to drag and drop blocks to write code. Students will get to learn the foundations of computer science, concepts which are used anywhere from making apps to controlling the Mars rover. In this game, learners use code to join Anna and Elsa as they explore the magic and beauty of ice. They create snowflakes and patterns as they ice skate and make a winter wonderland that they can then share with their friends. 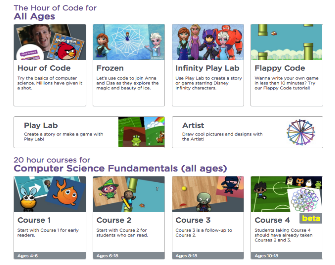 In so doing, students get to learn the basics of how to code. Students use Play Lab to create a story or game starring Disney Infinity characters. Using Flappy Code tutorial, students will get to learn how to write their own game in less than 10 minutes.